The most common thing people ask me on this blog is, “Do you have any Maps of Leh Ladakh or any Ladakh Road Map?“. And for the first few years, I used to wonder, how do I create one. However, I always knew the fact that once I create these route maps for Leh Ladakh trips, it will immensely be useful to all the travelers planning their trips to heavenly Ladakh region. Well, there are Google maps but they were not so comprehensive enough in the past. So, I had hand scribbled this Leh Ladakh offline map for all the readers of Devil On Wheels blog. Do I need any Leh Local Sightseeing Map? What all places these maps of Ladakh covers? Does this Ladakh route map tells me about road conditions in Ladakh? What is next on this Leh Ladakh maps series? Guys, I know I missed on my weekly blog article on Tuesday but I am sure that you are going to forgive me as in this little delayed weekly article it is an immense pleasure to roll out the first-ever maps of Leh Ladakh by DoW. I know this has taken a long time to come, almost 3 years, but better late than never and now we have one more accolade to compliment the 400+ articles on traveling to the Himalayas on Devil On Wheels blog. I am sure maps of Ladakh was one shortcoming we had in the Ladakh Travel knowledge base on Devil On Wheels blog and the Ladakh road map presented in the article below will help us a lot in bridging that gap on understanding the places & routes in entire Leh – Ladakh. Before I dig into the details, I would like to thank Aashish, the Chief Travel Mentor in our DoW – Himalayan Travel Community who pushed me hard enough and brought this idea to come alive of having DoW’s own maps of Leh Ladakh. In this Leh Ladakh map, I have tried to put details including places, distances, important monasteries, mountain passes, lakes etc. in entire Ladakh covering Nubra Valley, Sham Valley, Pangong Tso, Tso Moriri, Hanle and other parts of Changthang Valley. This Leh Ladakh tourist map also has a couple of legends that explains the fuel availability in entire Ladakh region & road difficulty level along with which type of car you might need to cover a particular stretch, list of ATMs in Ladakh. Though Black Diesel/Petrol is available at certain places, please note that quality of such fuel is compromised and shall only be considered in worst case scenarios. However, these are just my recommendations and should not be taken granted that even for a novice you can take a hatchback or sedan at the routes mentioning “All Cars” … The man behind the wheel must have some skills and experience with driving in the hills. Similarly, for taking up difficult roads, the person must have good experience in traveling or driving/riding to this high altitude terrain of Ladakh & Manali – Leh Highway especially. Though I am sure that the below maps of Leh Ladakh will help you immensely in understanding the places, moving between them & distances between them. However, for understanding the route conditions in more details I will strongly suggest that you read about Routes and Road Conditions In Leh – Ladakh. For quick access & importance, quoting from this article that “for each and every route sections elaborated below, I will try to suggest car types with difficulty level as Easy, Manageable, Tough, Very Tough, Car Killer Driving comfort is also taken into account while suggesting, so it is not just the driving. But, PLEASE DO NOT take it literally especially in the cases of Sedans and Hatchbacks. Even, if it is mentioned that route is manageable for Sedans and Hatchbacks, you still have to drive with extreme caution and care”. 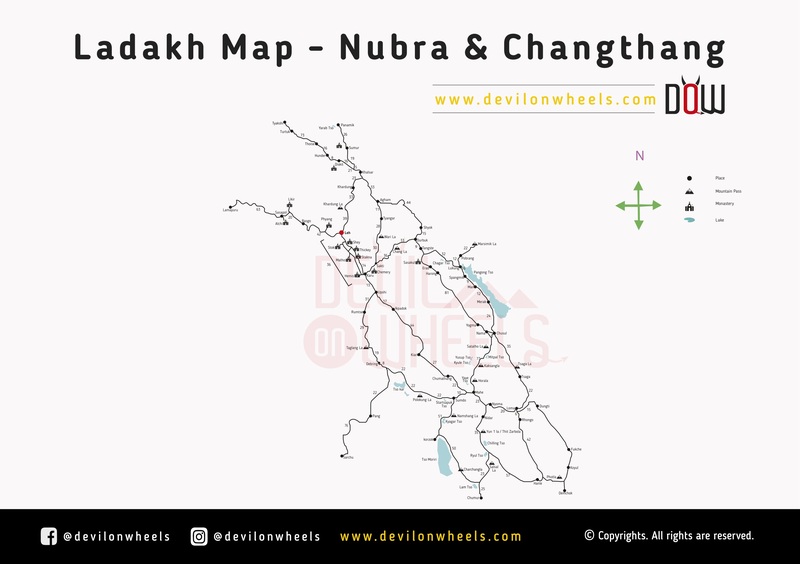 Download your FREE high-resolution version of Leh Ladakh tourist map pdf copy covering Nubra Valley and Changthang region. If, you liked it and found it helpful, please feel free to share it with your family and friends to help them too. Let me continue in this article and present the road map of Srinagar Leh Highway. We have talked enough on how to plan a trip to Srinagar – Leh Highway in my previous article where you can get a fair idea on the season to travel from Srinagar to Ladakh, modes of travel, how to plan a night stay, accommodations, sightseeing, petrol pumps etc. on Srinagar Leh Highway in detail. Hence, quickly skipping the details let’s jump over to see the detailed road map of Srinagar Leh Highway. Again, as in the first map, I have tried to put the details including places, distances, important monasteries, mountain passes, lakes etc. on Srinagar – Leh Highway. This time map also has a couple of legends that explain the fuel availability on Srinagar – Leh Highway & road difficulty level along with which type of car you might need to cover a particular stretch and list of ATMs. Since, there isn’t much issue with the fuel availability all throughout Srinagar – Leh Highway, so nothing much to worry about. However, these are just my recommendations and should not be taken granted that even for a novice you can take a hatchback or sedan at the routes mentioning “All Cars” … The man behind the wheel must have some skills and experience with driving in the hills. The roughest patch of Srinagar to Leh Highway is few km on either side of Zoji La Pass, especially from Baltal to the Zoji La Pass. Download your FREE high-resolution version pdf copy of this Srinagar to Leh Road Map. If, you liked it and found it helpful, please feel free to share it with your family and friends to help them too. Let me add the final section and present the road map of Manali Leh Highway. 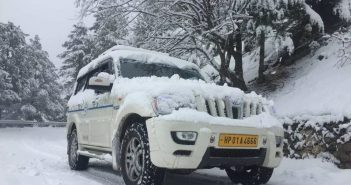 We have talked enough on how to plan a trip to Manali to Leh Highway in my previous article where you can get a fair idea on the season to travel from Manali to Ladakh, modes of travel, how to plan a night stay, accommodations, sightseeing, petrol pumps etc. on Manali Leh Highway in detail. Hence, quickly skipping the details let’s jump over to see the detailed road map of Manali Leh Highway. Again, as in the first map, I have tried to put the details including places, distances, important monasteries, mountain passes, lakes etc. on Manali Leh Highway. This time map also has a couple of legends that explain the fuel availability on Manali – Leh Highway & road difficulty level along with which type of car you might need to cover a particular stretch and list of ATMs. 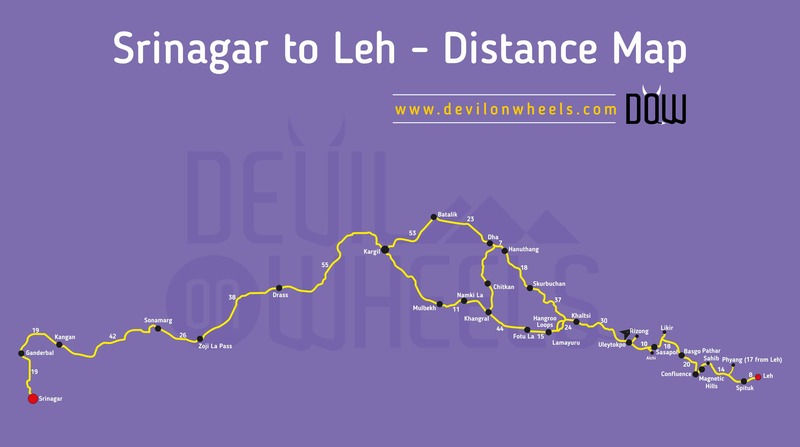 There are quite a few sections on Manali Leh Highway with troublesome road conditions and this Manali to Leh route map infographic shared below calls them out. Download your FREE high-resolution version pdf copy of this Manali to Leh route map infographic. If, you liked it and found it helpful, please feel free to share it with your family and friends to help them too. Please note that all the distances & places indicated are approximate in unit and location in this Leh Ladakh offline map. The data has been collated for just a fair idea & is completely based the notes of my own Ladakh trips, roads signs & pictures of boards clicked on those trips, Wikimapia, Google Maps, a map of Harsh&Aarti, some GPS Trails from the Internet or googling, trails shared by some fellow travelers. Your suggestions on improvement on these Leh Ladakh road maps are highly welcomed and please keep in mind that this just tells you a tentative idea of the route and distances between the places. It does not depict the entire route as is, so there could be minor twists and turns not outlined in this map. Feel free to provide your inputs/suggestions or feedback or any questions you have on road maps of Leh Ladakh. 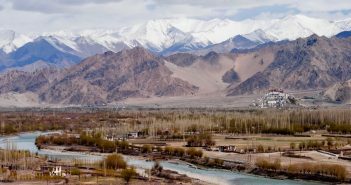 These Leh Ladakh maps will help you plan your road trips to Leh Ladakh successfully and will help you come back with tons of Ladakh photos. We have planned for bike trip from 18th may 2018, from chandigarh to Srinagar-Leh, Will the Route be open? Most likely this year Manali – Leh will open by that time. Srinagar – Leh is already open. Please suggest or advice if i planned it wrong. Carrying tent and sleeping bags for this trip is good idea? Brother you have uploaded the map of leh district only ladakh include two district one leh and other being kargil please correct it..
We are planning for a bike ride to leh Ladakh from Manali with my 3 other friends. Here is my literary which we are planning to follow.Can you just verify this? Do we need to modify our plan here? Day 2: Stay at Manali – Rent an RE bike. I’m not sure about staying in Sakti village, but I don’t want to go to Leh back just for staying there. Also, Since we are planning to rent a bike, how can we store extra petrol that we should tag along for the journey? We can not add one more day in this day as this is the best considering the leaves that needs to be approved for the journey..
And also is there any way we can skip leh and cover hunder- pangong tso- Hanle-tso moriri. I happened to stumble upon your blog last year when I was looking for places to visit in Himachal and then read your recommendation on Tirthan Valley. I visited Tirthan Valley in April 2016 and stayed at Raju’s Cottage. The place and Raju’s Cottage were true to every word you said. Now I am back for more of your suggestion and advice. I am planning to go to Leh Ladakh in September this year, from 2nd to 11th and we are flying from Bombay to Leh directly. Would be great if you could share an itinerary of places to visit, stay…things to do. Hope you are doing good and Thanks for the suggestion. After going through suggested itinerary, I have planned my trip and I would need your advice/inputs. We have to obtain ILP for rest of the places and I have read that we have to give detailed route map/places/date and then obtain ILP. What if we miss out on that date to travel? will they allow us to travel the next day. ILP comes with some validity, but is that mandatory that we have to travel on said date? Q1: is that I have to mention Khardung La,Diskit,Hunder in ILP or have I MISSED any places? Q2: Do we have petrol Pumps in Daskit/Hunder? or can we get it in black? Q1: do we have to submit ILP in this route? Q1: is that I have to submit copy of ILP while heading back? Fill petrol in Karu and carry additional. Q1: Which are the Places should I mention in ILP? Enroute: Korzok,Upshi,karu[fill petrol and then back to upshi],Sarchu. Q1: Do we need ILP for these places? If yes,can you please list me the placed to mention. Will have a day or 2 as buffer. Please let me know the places to be listed out in ILP which would be of great help. Thanks Dheeraj bhai, I will modify the schedule accordingly. And how about the inner line permit? Can you please mention the places which requires inner line permit. Or do you have any single list which lists places which requires inner line permit. Thanks for the comprehensive leh ladakh map, it will definitely help people like me, plecially deficulty level mention on it. Now one question if it is right place to ask as it remained un answered that when compaired with batal-gramphoo streach how do you rate the difficulty levels of blue line indicators of this map. As I have already done that part and would like to mentally prepair for this tour. Your feed back is highly appreciated. this is simply amazing Dheeraj. Thanks for sharing this. Appreciate your effort. Thanks Prashant, glad you liked it and the info. was useful for you. Hi, Do you organise tours for self driven vehicles? I’m interested in joining a caravan for a Himalayan Roadtrip. 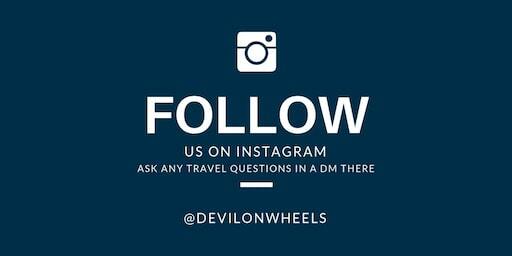 No Pulkit, Devil On Wheels is a Travel Platform to share information with fellow like minded travellers for free. There are some petty people who do it with similar name with few spelling changes, please beware of such copy cats as they use our name or similar name to fool people for their own commercial purpose and have heard tons of complaints about them from the people who got duped. Starting by saying “Hats Off” to this amazing blog. 6 of us are planning to travel to leh ladakh in july end-aug start for 6n approximately. We are planning to book our train tickets till delhi, but at the same time can you suggest us the best option to travel in a budgeted way till leh. shall we book till Delhi or Chandigarh and how do we commute from there. Also from ur viewpoint if you can tell about the best places to be visited in these 7 days and which hotel to book where so that we can follow the same and will save us from doing the bookings with travel packages. From where do we hire car ? which places to see? how to reach leh ladakh ? which places to explore to eat. share your suggestions so that we have memories to cherish for lifetime. Can I take print of this map? If yes – what will be the best suitable size (paper) to print the same. I want to carry the same along with me during my Oct. trip to Ladakh. i forgot to say a Big Thank you to you as you are a constant guide and inspiration for us. Dheeraj, i have decided to join Leh Ladakh trip arranged by my friends. they are inconstant touch with you regarding that. we will be at Leh from 10 to 20 th Sept 2015. i will be happy to know about the current weather status at Leh and surroundings. should we carry raincoat? the day time temperatures of 20 to 24 degrees and night temperatures of 4 to -2 degrees is what we will be expecting during these days. am i right? we are apprehensive as kids (1 to 15 years) and parents (60s) will be there with us. do we need to worry for any specific things? couple of friends who had been at Leh recently said its very dry during these days and is troubling the tourists a lot. to what extent is this true? No rains will be faded away from lower hills by that time. Yes, you are right in temperatures but it is what the real feel that makes the difference. Real feel is much lower as the wind is cold up there so go prepared well in layered clothing. It will be cold especially at nights at the high altitude lakes for sure. I cannot create a post or start a new thread in community forum,why? What is the problem you are facing Anshu? I don’t see a link for starting a thread or create a new post in the community forum!! Dhairav, it is fine but how does it solve the problem? It is not a matter of one checkpost, if seen local taxis up there at these locations will confront you. There are checkpoints to these places as well, it is not just Leh where the problem is. I want to share my itinerary that we have planned for Delhi – Leh – Delhi trip. Could you please have a look and suggest if it is okay. Eagerly looking forward to your expert recommendations. We will be taking a self drive rental car and I will be the only driver, though my friend can drive a bit too. Also, does the taxi union create any issues at Kargil for the Zanskar Valley travel? Regarding plan, looks fine to me. Do ensure that there is some vehicle to accompany you while taking Wari La route as in case of any help, you will not be able to find it in distance due to the desolation. 1st of all you all a big salute to you for your effort for hosting a great blog like this. We are two people planning to go for Leh trip during August. This will be our second trip to Leh. Day 1- Landing at Lah in the morning, evening local sight seeing. Day-2- Leh local- Shey, thiksey, Hemis etc. Day 3- Nubra valley, night stay. 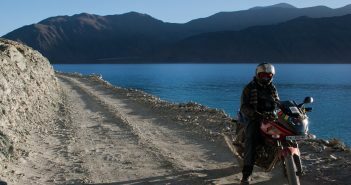 Day 4- Nubra to Pangong Tso (night say)/ Nubra to Turtuk and back to Leh. Day 11- back to Home. Whether the above routes are feasible logistically. We will be travelling by any car/ SUV.Most probably we will be going by last week of August. Can you recommend any person who can arrange the above mentioned trip economically. Thank you for the kind words 🙂 … Your about route seems fine to me though be ready for every day travel by road. I am not sure if anyone can help you with Hanle but still you can check out with [email protected] as they had been quite nice and supporting to most of the readers in the past two years or so. You can refer me or DoW if required. 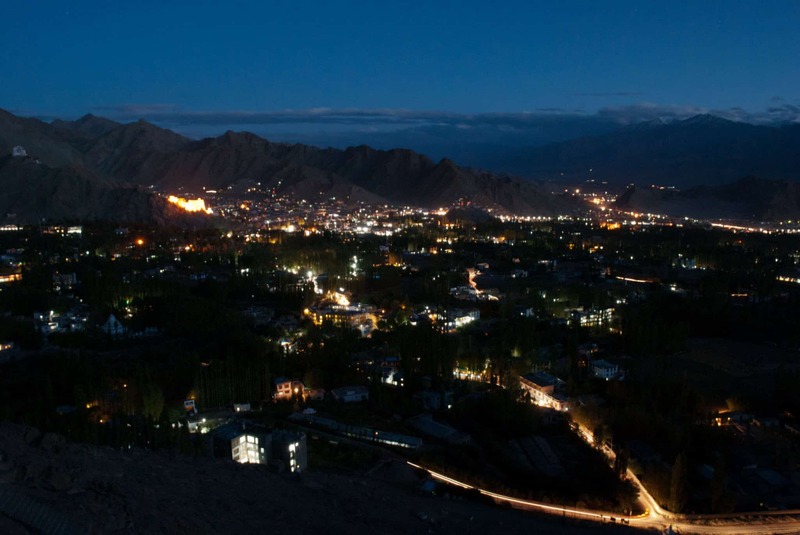 Any tourist guide for Ladakh I should carry or the info given here is sufficient ? The stretch from Debring to Pang is quite smooth & does not require high GC. After Pang, it is a mess. Wow Dheeraj and the entire team of DOW. Really appreciate all your efforts in solving the ineffable mysteries of the Himalayas. Printed out the maps and it is going to be a part of my room now. Hopefully will be able to join you guys soon. Cheers!! Your Comment…nice…..awesome…. .Is self bike driving on manali leh highway dangerous? should two person ride one bike for this trip? Hi Dheeraj wonderful update here. Just a slight change – the road post upshi is under renovation and the project deadline is june-july 16. The 15kms patch from Upshi towards Hanle is in bad shape. This is as per my ride in Oct/Nov 14. Also the Chusul – Erath – Padna is being fresh laid (currently high GC needed) and will be a joy ride going further. I am Planning to Come at Leh at Aug. end, Pl. tell me about the taxi for site seen. Thanks for uncovering the hidden places. The maps are undoubtedly fabulous. Can you add a map of the Zanskar region..?? Pratyay, thank you so much !! Yeah, work is in progress for the map of Zanskar Valley too. I will add it by end of July. I have a question. You seem to know every corner of Ladakh. How many times you have been to Ladakh..?? You are doing nice job.i also planning to go leh with my family after the reading your opinion,i re-plan my tour.thanks again thank u.
do you have similar map for manali – udaipur – kistwar – route ? Sorry ashish, no map for Manali – Udaipur – Kishtwar. May be in this season will release couple of more maps. Dear Dheeraj I am planning to go leh by second week of june. I have few questions for you which will definitely help me throughout the tour. First I want you to make a route for me from Leh – Nubra Valley – Pangong Lake – Tso Moriri – Manali. I need each & every single detail for this route like petrol pumps, night halt options, road conditions etc. Both links above contains all the details you need. Thank you so much., Glad to know it is useful for you. Have been reading your excellent posts. Many thanks. Any advice on an itinerary would be very helpful. Kapil, Ladakh is not a vacation destination dear. With kids running over snow in Ladakh!! Not a best idea or vibes I get from your expectations of Ladakh. It is harsh but beautiful place. Seeing your expectations I would have said NO even in season time BUT that is off season in Ladakh and all roads are closed to it. You can only fly in directly to Ladakh. Then, the it will be extremely cold out there and you need to fight a bit to survive the cold plus scarcity of oxygen for initial days. Are you game with the family?? Better try some lower hills around Himachal I will suggest or do basic circuit Kashmir Valley. Useful information-packed stuff marked on those maps. As Mr. prabhu said the main concern will be the fuel and it also matters that which vehicle you will having, how many people so that it can be planned that how much space you will have for carrying extra jerry cans for spare fuel? After leh, the next fuel station will be at tandi, which is after keylong..
That would be not less than 700 km. Only functional petrol pump on you way is at Leh. Do the math, how much extra fuel u need to carry. Urvanki, it all looks fine on paper and this map BUT logistics will be key here. Unless you are on your own and carrying extra fuel with you and courage + adventure heart with you, this is difficult. In a taxi, you can give it a shot BUT it will be on mind blowing cost for just 2 people. Secondly, I see you have 12 days ex Srinagar to Manali and doing something like what you are indicating is something like staying only on roads for those 12 days. I am not saying it is not possible, but better read the road conditions article too to get an idea what you can expect on these road too.